Newmarket, Ontario originated as one of the many farming communities in the area during the 1800s before expanding and growing to a population of over 80,000 people. It is the home of legendary athletes, comedians and politicians. It’s also the birthplace of rock band The Elwins. Comprised of Matt Sweeney (singer/guitarist), Travis Stokl (drummer), Feurd (guitarist/keyboardist), and Francesco Figliomeni (bassist/singer), the band formed more than a decade ago and has finally released the follow-up to their 2015 LP Play for Keeps. Beauty Community was recorded in Toronto’s now-defunct Fox Sound Studios, with producer Derek Hoffman. Although they went into the studio with some written material, the majority of the writing was in the studio. They spent a few months recording before handing it over to Jason Dufour to mix and João Carvalho to master. “The album title is a neat one for us. We like the mystery of it - it doesn’t really have a particular meaning but I think anybody could make up their own version of what it means to them,” Feurd said. The album artwork is a hyper-realistic version of the band, appearing to be 3D printed sculptures but is actually a completely digital rendering. It adds to the overall sound of the album; completing it, in a way. 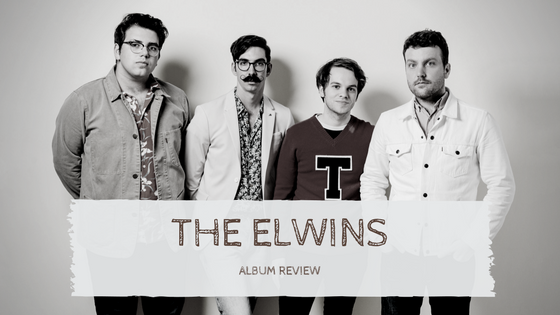 In addition to the 12-track LP, The Elwins decided to release a music video for each song. The concept started as wanting to release videos before ultimately morphing into a lyric video series. Each video was shot in Newmarket, where directors Zach Rose and Jesse Korgemaa – as well as people from the town of Newmarket – were heavily involved in the video concept. The first video of the series is for the track “Hocus Pocus”, where the band is seen playing an intense round of bowling, while the second video for “Dreamgirl” stars their manager’s 102-year-old grandfather. The latest video for “Watercolour” is an equally intense car wash sequence that keeps with their unpredictable yet brilliantly composed narratives. Although it’s not a lyric video, they released a music video for “Hey! Ya, You” featuring white walls and a whole lot of hands. The lyrics takes a more physical than metaphorical approach, while the video gets extra physical in forms of the line, “So you can take my hand and just get attached”. The song itself screams danceable with a unique twist. Other notable tracks include “Your Very Own Beauty Community” which is completely instrumental; it originally started as the idea of an interlude before growing into a longer track. With Stokl on guitar/banjo and Feurd on drums, the two minute and 27 seconds track is the unexpected element that really ties the record together. The last track, “This Is It”, was one of the first songs Sweeney wrote for this album. It’s reminiscent of The Strokes; simplicity in its instruments with a memorable bridge. As a whole, Beauty Community is flawless in its lyricism and polished in its instrumental. As The Elwins continue to release their lyric videos, each track is likely to become more emotionally rich than the last.